Certainly the title of the presentation, which doubles as the title for Stratten’s new book, catches your attention right away, just like the man himself. 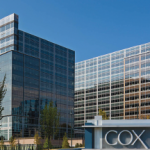 Stratten, who claims to know absolutely nothing about SEO, invented the ‘No’ Button website, where visitors click an animated button to hear a bellowed “Nooooooo!” for eight seconds. That’s the entire site. Sound a little strange? Try it, I bet you’ll return to the site soon enough. Overall, it’s received 20 million views, and as Stratten notes, he ranks first on Google for every version of “no” except for the two-letter version itself! But seriously, why do QR codes kill kittens? 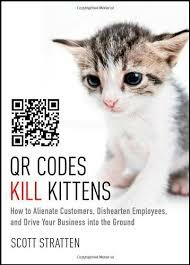 Because every time a QR code is used improperly or excessively, a kitten dies, Stratten says. He’s joking (right? ), but his point is a good one. They can be effective, but they’re being forced on a consumer base that’s not willing or ready for them just yet. At least not that ready. Perhaps Stratten’s most telling example is a poster of missing pets, which has a QR code directing users to a reporting website. The idea itself makes sense, but when you begin to break it down, you start to see a number of holes in the strategy. For instance, Stratten notes a total of 3.6 percent of smartphone users are capable and willing to scan a QR code on their smartphone. The willing part is important, because if a user tries once and it doesn’t work effectively, they’re far les likely to try again. As Stratten explains, there has to be a better way for individuals to contact an owner if they find a missing pet. That better way? How about, I don’t know, a phone number? While less than 4 percent of people will be scanning the QR code, 99 percent of cell phone users have the capability of calling a telephone number. It’s easier, and more effective. Don’t just use QR codes for the heck of it, especially when there’s a much simpler way to accomplish your objective, Stratten explains. For Stratten though, the overall point isn’t just about QR codes. It’s about doing too much, and not focusing on what matters. As I noted in my presentation yesterday, you shouldn’t just “use Facebook for the sake of using Facebook.” You need to focus on the important things, particularly the content you’re producing. You can Tweet, Facebook and Instagram the heck out of something, but if the content itself isn’t quality, it’s really not going to have much reach. The pressure on marketers is to hop on the next big thing, just so you don’t miss out. But that can be a dangerous game. As QR codes show, there’s probably some value in each of these mediums, but they need to be used correctly – and not overused – so that this value isn’t obscured. Ultimately, it’s not even about the tool itself, it’s what you do with it. At the end of the day, there’s so much being thrown at marketers, it can be tough to sift through the mess to come up with an effective strategy for your brand. But what Stratten wants to convey – in between showing us hilarious tweets from Taco Bell and police departments – is that regardless of the branding avenue you choose, make sure the message is a good one. That’s what’s really going to attract the Likes, ReTweets and +1s.